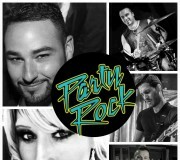 Party Rock – Melbourne’s Hottest Cover Band is ready to entertain you, playing Classic Hits and your favorite TOP 40! Party Rock are professional musicians who have performed in Australia’s most popular venues and festivals, working with International Popstars & some of Australia’s Best Talent. Party Rock’s enthusiasm, class, experience, consistency and quality is what makes this band a standout from all the rest! I just wanted to send a quick note to thank Craig & Gayle Symons and the staff at Uptempo for the flawless professionalism shown to me in my time dealing with your company. Hi Craig, just wanted to thank you for your assistance in organising Ben Price to attend our function on Wednesday night. Craig, you were an absolute dream to work with! I had a dilemma & you gave me an immediate solution and a fantastic solo artist that our consumers and guests absolutely raved over. Honestly the best service I've experienced in this industry. Thank you!